You are here: > Home > Blog > What Is An Uninterrupted Power Supply? The primary role of an uninterrupted power supply is to provide back-up power when the mains power supply fails. The term ‘uninterrupted’ may be misleading as not all uninterrupted power supplies provide a no-break supply. UPS Systems are group and classified according to EN/IEC 62040-3 into three distinct types based on their electrical performance characteristics and design topology. The three types are: On-line UPS (VFI), Line Interactive (VI) and Standby (VFD). 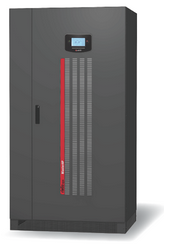 Only an on-line VFI-type UPS system provides a true uninterrupted power supply. The inverter constantly powers the load with a digitally generated sinewave output which is independent of the input power source’s voltage and frequency. Hence the classification term: Voltage and Frequency Independent (VFI). A line interactive UPS almost produces an uninterrupted power supply. The inverter may be energized but only connects to the load when the mains power supply fails. In this instance there may be a small millisecond break in supply to the load. Computers, servers, IT and modern electronic equipment use switch mode power supplies that are capacitive (as opposed to inductive) type loads. The power supplies store energy within their circuits that can cover small millisecond breaks in the supply. When mains power is present, a line interactive UPS does not interact with the frequency. Only the voltage is corrected, either using a built-in automatic voltage stabiliser or when the inverter engages. Line interactive UPS systems therefore are termed ‘voltage independent’. Standby UPS are voltage and frequency dependent. As with a line interactive UPS the power supply generated can have small millisecond breaks in supply. These are typically longer than in a line interactive UPS and the output waveform may be more of a step or square-wave rather than a sinewave. Standby UPS again, almost produce an uninterrupted power supply and rely on energy stored within capacitive loads to cover inverter activation times. For critical power applications including servers and datacentre environments requiring an uninterrupted power supply, On-line VFI UPS systems are the preferred choice. As their inverter systems are rated for continuous running, on-line uninterruptible power supplies also provide the additional advantage of being able to provide long runtimes through the use of additional battery extension packs.